EVERY MORNING OF MY LIFE... 7:00 AM ALARM 7:05 AM ALARM G - ProudMummy.com the Web's Community for Mums. 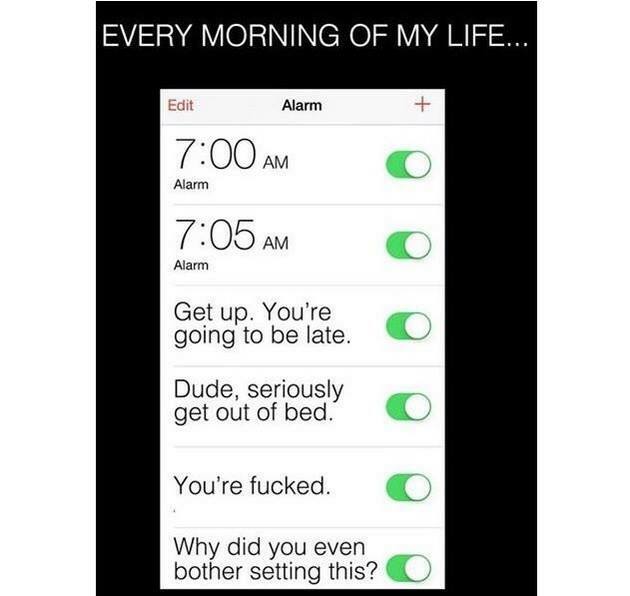 EVERY MORNING OF MY LIFE... 7:00 AM ALARM 7:05 AM ALARM GET UP. YOU'RE GOING TO BE LATE. DUDE, SERIOUSLY GET OUT OF BED. YOU'RE FUCKED. WHY DID YOU EVEN BOTHER SETTING THIS?